You must be a member of the London Hellenic Group to attend this activity. Would you like to join this group? 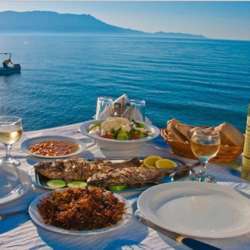 During the night together with a glass of re or white wine you will be served full course mezes, which includes a variety of starters, dips, calamari and grilled halloumi, Greek salad, chicken and pork skewers and baked lamb. Finishing off with some Greek deserts. There is also a vegetarian option. You will also be able to purchase a variety of quality Greek wines and beers for a reasonable price. A payment of £5 (refundable) via paypal will enable you to reserve a seat. Full payment will then be needed on the night.